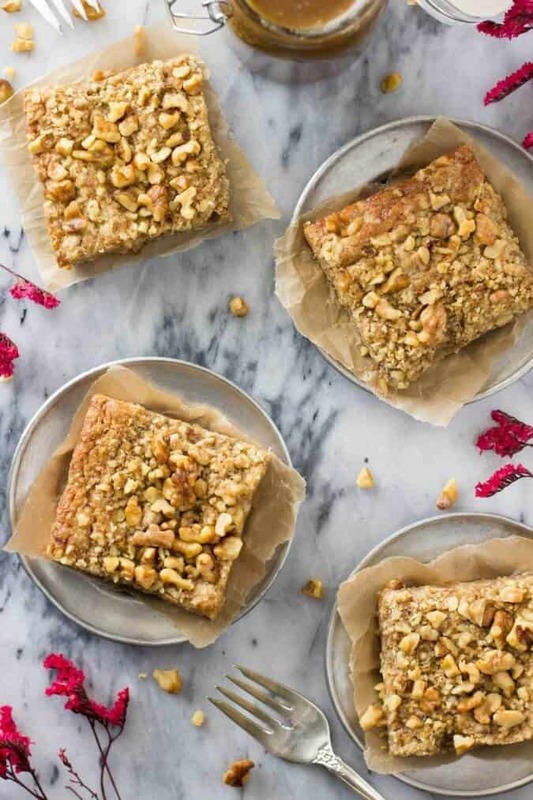 Decadent, chewy blondies made with browned butter and maple syrup and topped with a crisp walnut crumble. I like to spend my autumns holed up in the kitchen, tapping my foot to the rhythm of my KitchenAid, warming the kitchen to a comfortable 350 degrees, and burying myself in baked goods. Fall weather is baking weather. Technically, all weather is baking weather in my house, but I don’t know if I ever enjoy it as much as I do during the Fall. During the summertime, I feel mostly limited to no-bake recipes and fruity desserts, but right now I don’t feel so bad about warming up the kitchen with the oven (especially since Zach doesn’t believe the heat should be turned on until January! ), and fall flavors are so much fun to bake with. 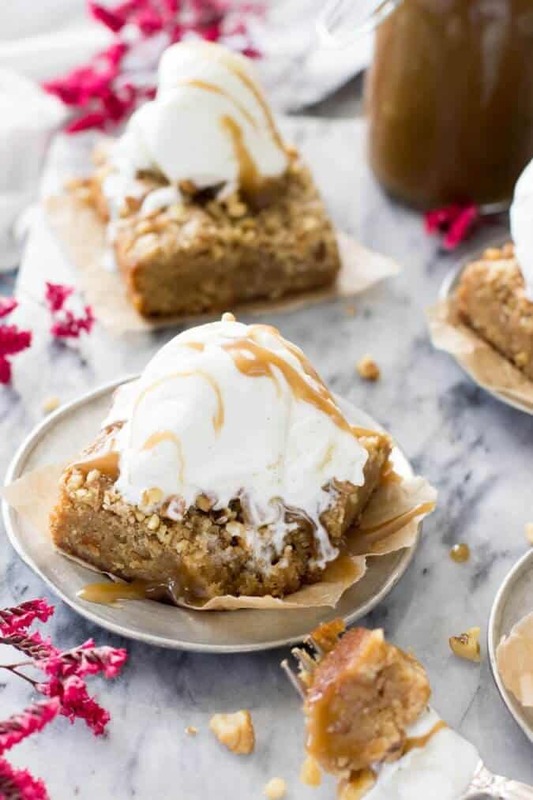 I’ve captured some of the best flavors of fall here: browned butter, brown sugar & walnut crumbles, and a hint of maple, all topped off with vanilla bean ice cream and homemade salted caramel sauce. Let’s talk about browned butter for a second. Have you ever made it before? I’ve used it both here and here, but haven’t ever used it in blondies (…or anything else, for that matter) before. Browned butter is made by heating butter in a saucepan until most of the water cooks out of it (in a snappy little orchestra of pops and sizzles) and it begins to brown. It takes only five minutes or so, and fills your whole kitchen with a buttery, nutty aroma that I have no idea why Yankee Candle hasn’t yet incorporated into their collection (I would buy so many brown butter scented candles!). 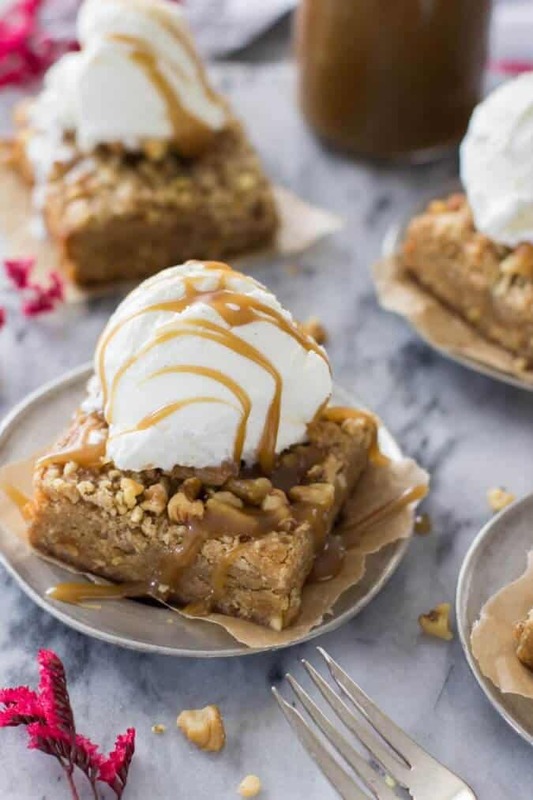 The browned butter helps make these blondies nice, soft, and chewy (and, of course, rich with a next-level depth of buttery flavor), but that’s not the only factor at play. Brown sugar and maple syrup also are key factors in keeping things nice and soft. The maple syrup is subtle (and you can definitely use maple-flavored pancake syrup, if you don’t want to spring for the pure stuff), but it helps with the chewiness and adds to the flavor. I topped everything off with a walnut crumble (the same one I used in my sour cream apple pie, in case you were trying to remember why it looked so familiar) which adds a nice crunch in contrast to the soft chewiness of the blondie. 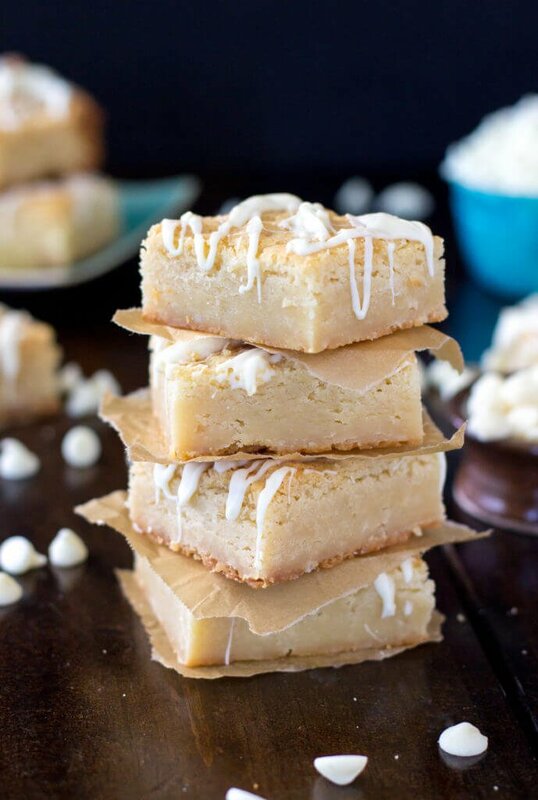 Then, if you’re feeling extra indulgent, warm your blondie before enjoying (these taste good at room temperature, sure, but please do yourself a favor and try them warm! ), top it off with vanilla ice cream, and drizzle with some homemade salted caramel sauce. Preheat oven to 350F (177C) and grease and flour a 9x9 pan. Cut your butter into Tablespoon-sized pieces and place in a medium-sized saucepan. Melt over medium-low heat. 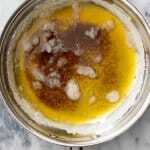 Once butter has melted, increase heat to just above medium heat. Swirl and scrape the sides of the pan frequently with a wooden spoon or heatproof spatula - the butter will bubble and pop. Once the bubbling/popping slows, the butter will begin to turn brown. Watch it carefully, and once it begins to brown and you smell the nutty aroma of browned butter, remove from heat and pour into a large, heatproof bowl. Allow butter to cool at least 15 minutes. Meanwhile, prepare your dry ingredients. In a medium-sized bowl, whisk together flour, baking powder, and salt. Set aside. Once butter has cooled at least 15 minutes, stir in sugars and maple syrup. Stir well. Add eggs, egg yolk, and vanilla extract. Stir until well-combined. Gradually stir your dry ingredients into your wet and pour evenly into your prepared pan. Prepare your topping by pulsing flour and brown sugar in small food processor. Add butter, and pulse just until coarse crumbs form. Add walnuts, pulse once again, briefly, and then turn food processor off and carefully remove blade. 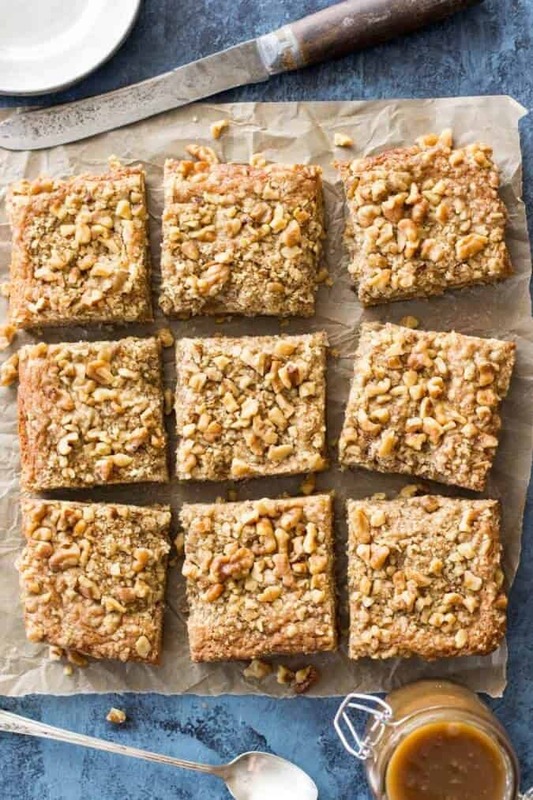 Sprinkle the walnut topping evenly over the prepared blondie batter. Bake on 350F (177C) for 35 minutes. 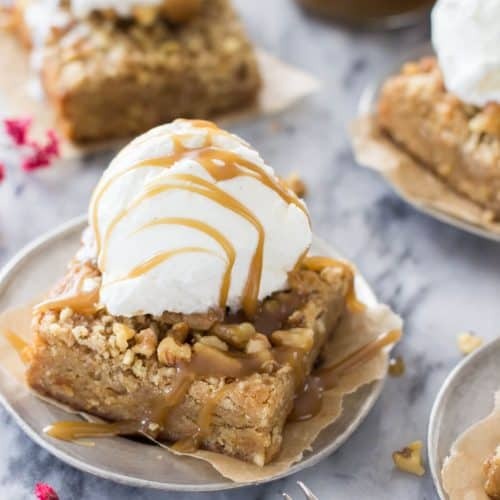 Serve warm, preferably topped with ice cream and salted caramel sauce. Hi Sam! 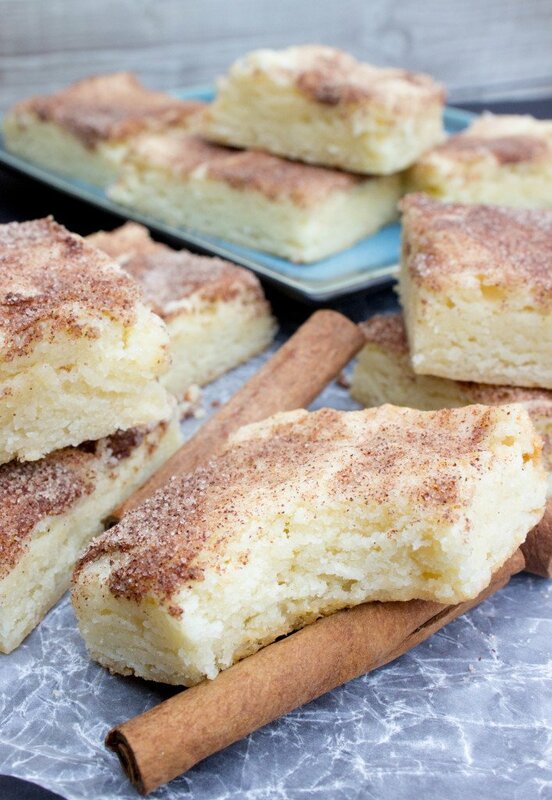 I want to make these with pecans rather than walnuts. Will that change the flavor profile significantly? These are truly AMAZING!! I made them for a Halloween party, and they were a huge hit! My daughter was eating the sauce right out of the pan…she couldn’t wait for me to dish it up for her. They definitely help! We’re having a bit of a warmer streak right now but I’m still cold! 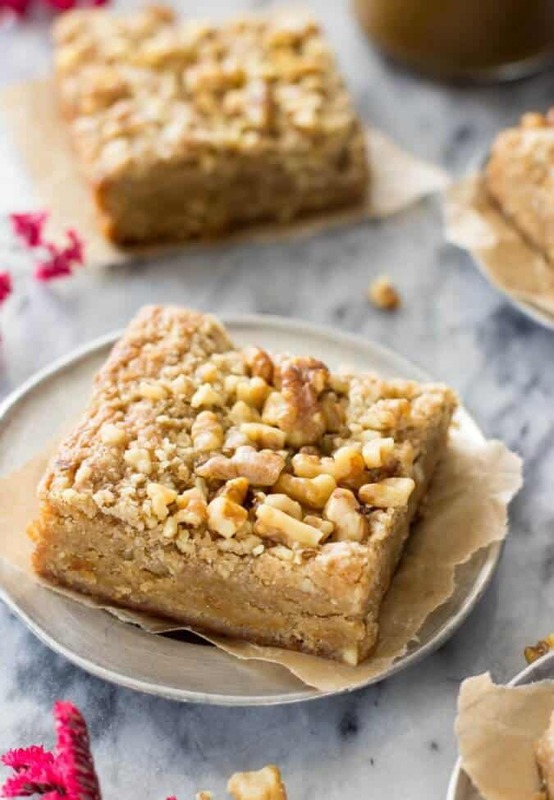 I’ve had browned butter cookies before, but never browned butter blondies. These look too good!